New Ash Green v Leybourne - New Ash Green won the toss, Leybourne were inserted and as so often for oppositions this summer struggled to score off our opening bowlers. Skipper J Nash changing it up a bit to bring on J Elisak to replace himself after 5 overs, this week a mere 37 runs were on the board after 20 overs, I Mellor 2-15. Pressure brought wickets but not a better run rate and Leybourne finished out the innings on 90-8. The other wicket takers: G Wale 3-23, J Elisak 3-27 and five added another catch to their fantasy points total. After tea, in contrast, with solid performances by P Webb (30) & P Sumner (31), with the other batsmen all contributing, New Ash Green were 81-5 at the 20 over point, and D Freeman coming in shortly after had only to find a boundary to take New Ash Green to the win with 5 wickets and 18 overs to spare. So at the cost of missing watching the England match live, New Ash Green continued their own campaign in good spirits. Ash Village v New Ash Green - Friendly match, timed game contesting the Matthew Quantrill Memorial Shield. On a very warm afternoon New Ash Green were invited to field and consequently a generous selection of bowlers were to watch their figures suffer at the bat of in-form S Mason (78) & S Benn (58) as the fielders cooked in the sunshine. Credit to K Poole (2-14 off 6 overs), M Bushe (0-16 off 8 overs) & F Quantrill (0-20 off 7 overs) for a determined attempt to contain the batsmen. Ash declared on 215-5 at tea. A wicket apiece to E Quantrill, S Freeman & P Webb; and a catch for A Noakes. In reply New Ash Green equally found the boundary on only one less occasion, but despite a spirited reply from L Shaw (27), noone else managed to stay long enough for double figures until D Freeman came in at 8 and enjoyed adding another half century to his tally, finally bowled for 52. The Quantrills added 10 apiece and Felix stayed on as runner to assist M Ives and hopefully confuse the fielders. However New Ash Green were all out for 146 and Ash retain the trophy. A good match in good spirit, and we look forward to rebalancing the tally in the last match of the season. Kent Regional League Match - 40 Overs. 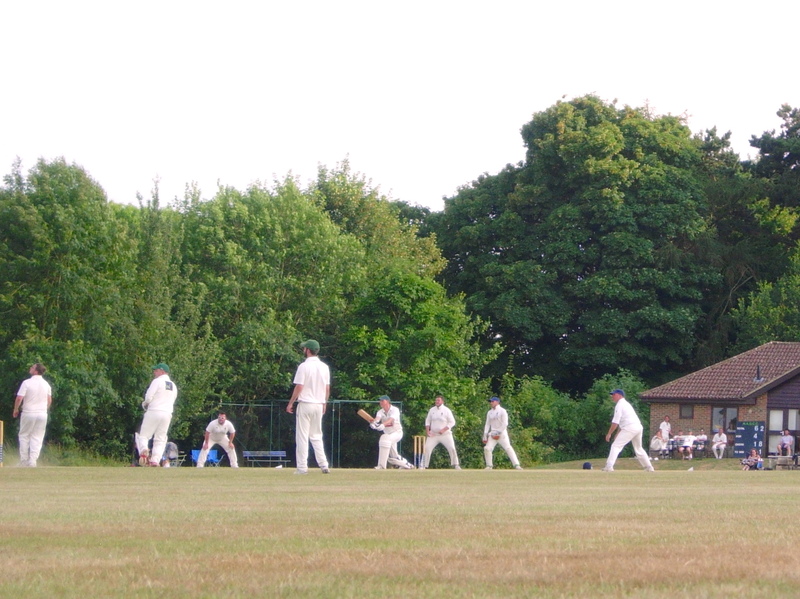 Leybourne (7pts) 90-8 (40 overs); New Ash Green (19pts) 91-5 (21.2 overs); New Ash Green won by 5 wickets. Nash, finally winning the toss, or technically Leybourne calling incorrectly, elected to field, despite the high temperature levels. Much to the delight of the Leybourne players as they would have the chance to watch most of the football, prior to going to field after tea. The regular opening bowling pair of Nash and Ian Mellor took the new ball and kept a firm control on the Leybourne batsmen, Mellor (2-15) picking up two early wickets and reducing the opposition to 14-2. It quickly became apparent that the wicket was more suited to slower bowling and Nash, despite going for just 8 runs from his 5 overs, removed himself from the attack to be replaced by the spin of Joe Elisak. With Elisak's first ball being dispatched for 6, this did not look like the masterstroke the skipper was hoping for, but with a couple of field changes, Elisak soon got into a decent rhythm and made scoring difficult for the Leybourne batsmen. Gary Wale replaced Mellor following the end of his 10 over economical spell and continued to turn the screw. The Leybourne innings was going nowhere and Wale (3-23) and Elisak (3-27) destroyed the middle order. There was even a chance for Rob Wills to showcase his off break bowling, going for a very respectful 11 runs off his 5 overs as Leybourne finished their innings on 90-8 off the full 40 overs. New Ash Green took to their batting in confident mood and this was further enhanced by the opening stand of Pete Webb (30) and Matt Bushe (4) putting on 31, over a third of the required runs to win. Elisak (9) and Lee Saunders (2) came and went but Paul Sumner decided to take the game away from the visitors with some powerful hitting. A number of boundaries were struck, including a quite remarkable 6 over extra cover off the visitors returning opening bowler. By the Sumner departed for 31, the game was pretty much up with only ten required to win. It was left to Wale (7*), batting down the order following his bowling exertions, and Dean Freeman (4*) to see the side home for a comfortable 5 wicket win, within 22 overs. It's fair to say that Leybourne did not hang about after the game, paying the tea money and then departing, still smarting from being forced to play cricket on a Saturday in the middle of the cricket season. For New Ash Green this was a fifth win in a row and cemented their second place in the division, still continuing to chase Hartley Country Club for promotion. Six! Taking 16 off the over to ruin the bowler's figures. For more club photos check out our gallery & also our instagram.